One of the largest health disparities present in China is the inequality between rural and urban healthcare. In particular, rural patients face barriers to equal resources to healthcare access. 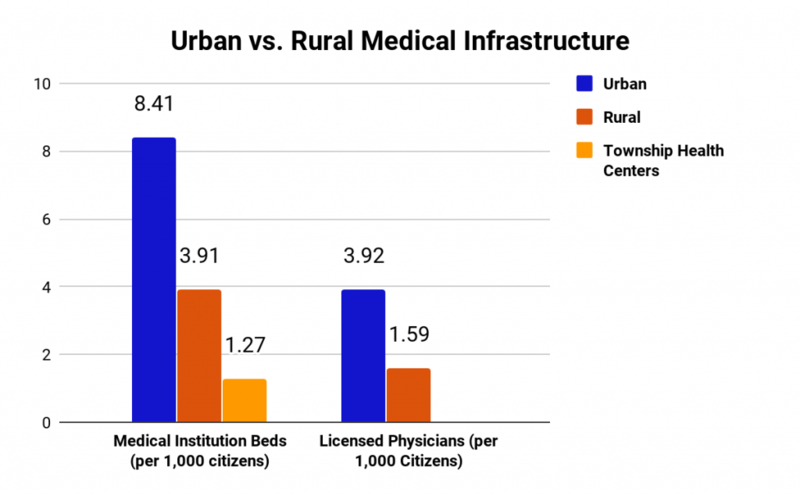 There are less than half as many medical institution beds and licensed physicians per 1,000 citizens in rural areas compared to urban areas. In even more isolated areas where there are only small township health centers and no hospitals, there are only 1.27 beds available for every 1,000 citizens, as seen in Figure 1. Also, rural patients are more likely to be significantly affected by medical costs. The New Rural Cooperative Medical Scheme covers most rural residents but this only reimburses a limited number of outpatient services and the reimbursement amount varies by county. Rural Chinese households with members who have chronic conditions have a 1.5x greater incidence of experiencing Catastrophic Healthcare Expenditures, or CHEs, which can push them into poverty than the average population. To understand the issues on the ground in rural China, we conducted field research in Wenshang County, a small area in the northeastern region of Shandong. Wenshang County is part of Jining, a third tier city, and encompasses a total of 14 towns and 495 villages. 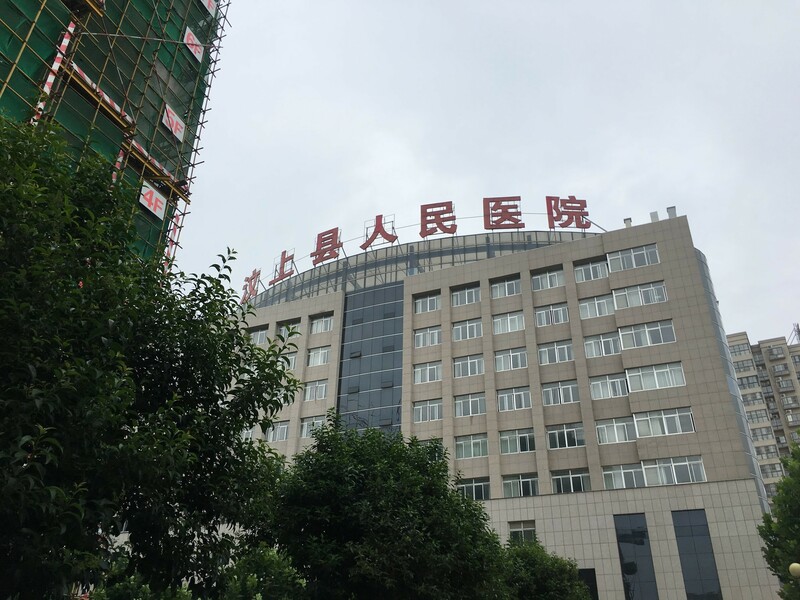 In Wenshang County, we interviewed physicians, health administrators, and government officials to understand their healthcare needs and challenges. In an ideal healthcare system, community clinics should serve as the first level of healthcare for citizens, treating minor illnesses and referring patients if the condition is more serious. However, we learned that many village clinics are limited in their ability to operate in this primary care role due to a lack of both training and compensation for physicians. Village doctors who practice only in the clinics receive unstandardized training, only three years of professional school but limited experiences otherwise. Legally, they also face restrictions on what treatment they can actually provide. Due to low compensation, many doctors must also hold other jobs to support themselves and their families. Understaffed and unequipped clinics continue the cycle of physician distrust and lead patients to go directly to Tier II and Tier III hospitals. Although telemedicine could support these doctors, many villages also lack the stable Internet connection and advanced technology to make this happen. Wenshang County Renming Hospital is the only public hospital that services the 800,000+ residents of Wenshang County. As a Tier II hospital with 950 beds, it is staffed and equipped to handle an array of issues, from minor illnesses like the flu to cardiovascular surgeries. The major technologies that the hospital employs include a CT scanner, DSA (Digital Subtraction Angiography) machines, and rehabilitation equipment. With the recent introduction of this advanced equipment and the work of specialized physicians, Renming Hospital has seen vast improvements in the care that they can provide patients, most notably over the last five years. Patients here face shorter wait times than patients in Tier III hospitals in bigger cities, where it may take a month to receive an appointment if booked online. However, in Weshang County, if patients come to the hospital, they will likely be seen on the same day. In the first half of this year, the hospital only referred 5% of its patients to other hospitals when their conditions required more specialized equipment or care. 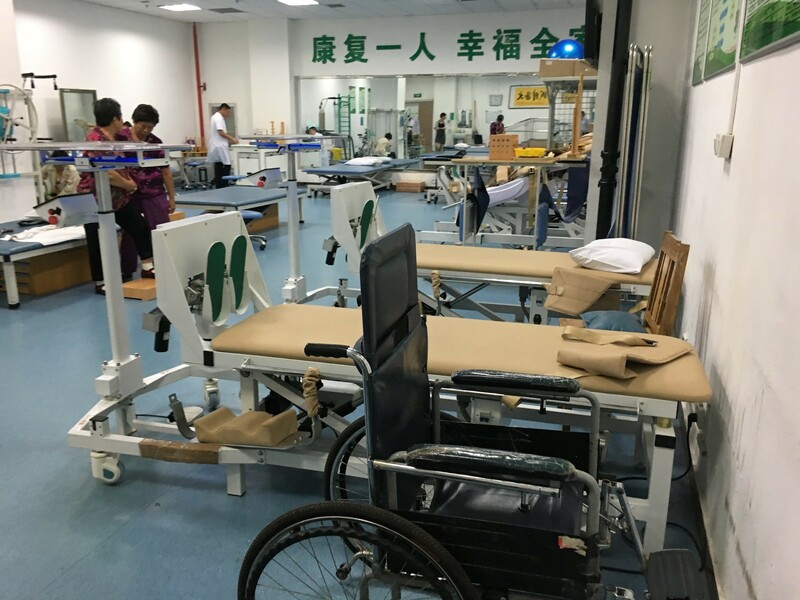 When patients need to be transferred, they are most often sent to the nearest Tier III hospital in the urban areas of Jining, which is at least a 40-minute drive away. However, this doesn’t stop some patients from directly going to larger hospitals for care. One physician said that he knows that “some patients will go by themselves directly to Third Tier hospitals, especially if they have their own thoughts about what’s about wrong with them.” This issue is especially prevalent because there is a less developed primary care system in China, so patients must self-diagnosis their conditions on some level. This means if patients think there is a big health concern or don’t trust their local doctors, they can directly bypass the closest hospital to them. Healthcare technologies, most predominantly telemedicine, may help connect rural areas to other hospitals with highly-trained physicians or technologies. In Wenshang County’s hospital, they currently use a basic internet-based telemedicine system to seek out second opinions on more complicated illnesses. 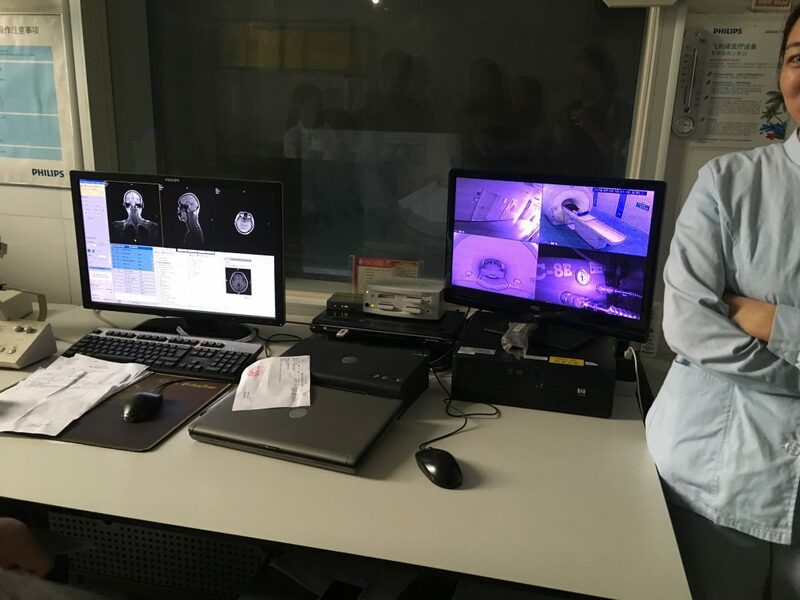 Using this system, they are able to discuss patients cases and medical scans with Tier III hospitals in central Jining. The local Wenshang County government is responsible for setting up the platform and regulating it to ensure quality and safety. The national government has been actively investing in rural healthcare, which has created positive momentum in the right direction. For example, in 2009, the government invested $127 billion (850 billion RMB) to develop infrastructure and human resources in rural clinics and community health centers. However, significant issues still remain, especially a lack of training and medical technologies. This problem leads to the insufficient utilization of these resources and the overburdening of Tier II and III hospitals. Going forward, major changes to raise the quality and range of care available at the community level will alleviate burdens felt across the hospital system. In particular, the needs of rural healthcare providers are more training opportunities for all rural doctors and increasing incentives for doctors to work outside of Tier III hospitals. The national government has expressed intentions to standardize physician education and promote a general practitioner (GPs) model. Patients would first see a GP who could address primary care concerns and be referred if they need more specialized care. This setup could greatly alleviate the burdens of rural hospitals, but would require significant resources and fundamentally change how everyday citizens interact with the current healthcare system. While major infrastructural improvements are slowly ongoing, there are also developments in medical devices and communication software that can be applied to address rural healthcare disparities. It is the ultimate goal that rural patients should be able to expect a high standard of care without being forced to make the trek into a larger city. To learn about other issues and opportunities for growth in the Chinese healthcare system, read our posts on Chinese Healthcare Trends: Rising Hospital Privatization and Chinese Healthcare: Challenges & Opportunities. For more information on the future of Chinese healthcare, keep an eye out for a full report that will be released in the coming months. This article was researched and written by Caroline Lee, Anson Tong, and Margaret Wang, Research Analysts at Collective Responsibility.